Recently, one of the most popular additions to sprinkler systems had been drip irrigation. We are installing many of these systems this year. Drip irrigation saves water by placing water drops right where they are needed– at the plant’s roots. This kind of sprinkler reduces evaporation and run-off. Drip irrigation installations also improve the aesthetics of gardens because the lines are nearly invisible. Besides flower beds and vegetable gardens, drip irrigation is also very useful for container gardens. Throughout the summer, it’s incredibly convenient to have containers automatically watered, leaving you free to go on vacation or simply enjoy your plants.Learn more by watching our video: Make Container Gardening Easy with Drip Irrigation. If you have an existing sprinkler system, drip irrigation is an easy add-on. Even without an irrigation system, you can still take advantage of drip irrigation with a hose spigot and timer. 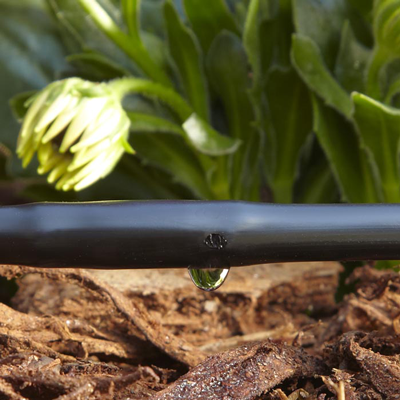 Could your garden benefit from drip irrigation? Call us for a consultation. My garden is suffering and I want to try and irrigate it. Thanks for the advice about how a drip irrigation system can help save time and water by placing water right by the plant’s roots. I would also recommend getting help from a professional in setting up your system.